I must say that I much preferred his grounding breaking work which involved the precise and in-depth critique and analysis of political economy in his classic Das Kapital – but hairdressing will do just as well! 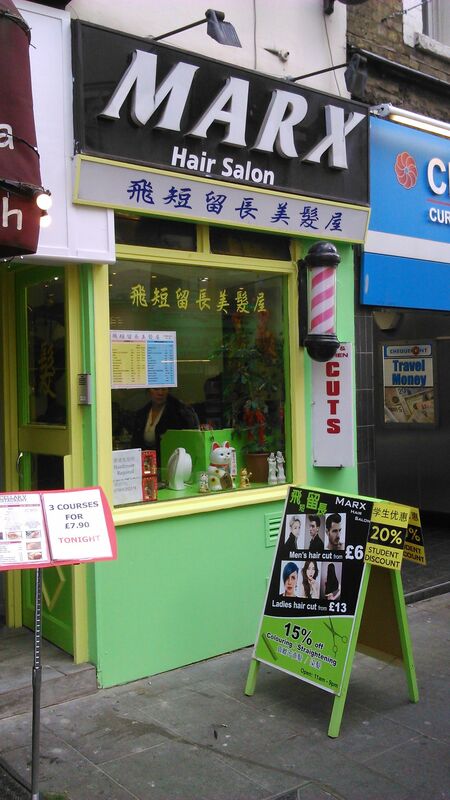 This picture raises some interesting questions, for instance, how many Chinese business people possess the Germanic surname ‘Marx’, and why would a hair salon be named after the founder of Scientific Socialism’? Of course, the owners of this business (whom I have never met), might well be from the mainland of China and like many modern-day Chinese, be proud of their Marxist heritage – and why not? The UK’s London Chinatown is one of the most diverse places in the world, and I wouldn’t be surprised if in due course, a Gramscian Grocery Shop and an Engels delicatessen did not spring-up at some point in the not too distant future!